As the staff at Matsuhisa Vail polishes glassware for the night ahead, guests at the bar watch the last diehards ski into the Colorado town. Launched in 2011, Matsuhisa Vail serves Nobu Matsuhisa’s spin on sushi in a contemporary space. While the renowned chef operates his Nobu restaurants with partners, he co-owns the three Matsuhisa venues—located in Vail, Aspen and Denver, all with independent beverage programs—with his family. 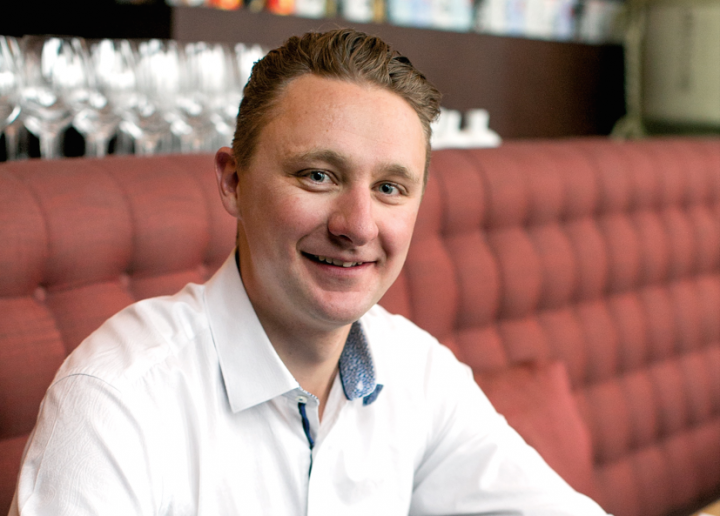 “We turn up the music, and there are no white tablecloths,” says beverage director Andreas Harl. “The ambiance is fun, and I keep the beverage program in tune with that vibe.” Matsuhisa Vail seats about 200 people and serves an average of 350 dinners a night during winter. Wine comprises 50 percent of beverage alcohol sales, while sake and spirits account for about 25 percent each. Harl heads all aspects of the beverage program, managing the 6,000-bottle wine inventory, placing orders, training nearly 40 staffers and working the floor. He grew up in the restaurant industry in Austria and began cooking alongside his grandmothers—both professional chefs—at the age of 12. After attending hotel management school, he moved to the United States and worked at the Sonnenalp Hotel in Vail for seven years. While there, he earned his Certified Sommelier Certificate at the age of 25. Since Matsuhisa’s opening, Harl has expanded the wine list from an initial 150 labels to 700, including 27 wines by the glass. Because individual food courses are small, he suggests wines that pair with two to three dishes. White Burgundy is the top-seller by both volume and value, followed by Cabernet Sauvignon and red blends from California, red Burgundy, domestic Pinot Noir, and Champagne. “I offer interesting wines from small producers for guests who want to go out of their comfort zone, but I’m not here to scare customers away,” Harl says. “Some people really want to drink Napa Cabernet Sauvignon with sushi, so I also offer the blue-chip Napa Cabs they request.” Examples include the 2013 Nickel & Nickel Rutherford Quarry Vineyard Cabernet Sauvignon ($200 a 750-ml. bottle) and the 2010 Heitz Napa Valley Martha’s Vineyard Cabernet Sauvignon ($450). Harl likes to pair white wines—both sparkling and still—with Japanese ingredients including yuzu, mirin and miso. Krug Grand Cuvée Brut ($200 a 750-ml. bottle) is the top-selling Champagne, and Michel Mailliard Cuvée Grégory Champagne ($22 a 6-ounce glass; $88 a 750-ml. bottle) is also popular. The 2015 Sattlerhof Styria Sauvignon Blanc ($17; $68) is the restaurant’s top-selling wine. “The success of this Austrian wine surprised me, but it’s performed well for five years,” Harl says. Grüner Veltliner is his go-to varietal for sushi rice seasoned with rice wine vinegar, and the 2013 Hiedler 1er Thal Kamptal Grüner Veltliner ($15; $60) is a top-seller. Matsuhisa is also a destination for Burgundy. “We saw that white and red Burgundy worked with our food,” Harl says. “I’m buying Burgundy to increase our depth and holding some back for aging.” His list offers 51 white Burgundies, from the 2014 Jean-Marc Brocard Chablis ($66 a 750-ml. bottle) to the 2011 J.-F. Coche-Dury Corton-Charlemagne Grand Cru ($1,800). There are also 92 red Burgundies, from the 2013 Domaine Parent Bourgogne Pinot Noir ($60) to the 2013 Domaine de la Romanée-Conti Romanée-Conti ($12,000). With sushi, Harl suggests lower-tannin reds like the 2014 J.K. Carriere Willamette Valley Vespidae Pinot Noir, ($20 a six-ounce pour; $80 a 750-ml. bottle), the 2014 Jean-Louis Dutraive Domaine de la Grand’Cour Fleurie ($17; $68) and the 2014 Occhipinti Frappato Sicilia Rosso ($90 a 750-ml. bottle). Tuna and other hard-to-pair foods go best with sake, Harl says. Of the 11 sakes offered, Nobu junmai daiginjo ($13 a 2½-ounce pour; $60 a 10-ounce carafe; $100 a 500-ml. bottle) and Nobu TK40 daiginjo ($20; $40; $125) are the top-sellers. Matsuhisa offers eight Japanese whiskies, including Yamazaki 12-year-old single malt whisky ($14 a 1½-ounce pour) and Hibiki Japanese Harmony blended whisky ($16). Five years in, Harl sees Matsuhisa Vail as a place where guests taste and discuss new foods and drinks. “It’s an interactive and entertaining meal, and the wine goes with it,” he says.